Corydalus cornutus is a dobsonfly belonging to the family Corydalidae and Order Megaloptera. The genus Corydalus contains 35 species restricted to the western hemisphere. Members of the genus have wing lengths ranging in size from 35-85 mm. They are sexually dimorphic, with males having large sickle-shaped mandibles. Corydalus cornutus is the type species of the genus and is widely distributed throughout the eastern United States. Eggs are laid on rocks or leaves above fast-flowing streams and may look like bird feces. The larvae, referred to as hellgrammites, hatch out and fall into the water. They are predators whose diet includes small insects, fish, and tadpoles. Hellgrammites are elongate, dull-colored larvae with gill filaments and feathery gill clusters along the sides of the abdomen. They have two hooks on the end of the abdomen. Larvae do best in well-oxygenated, high quality water. Larvae can take 2-3 years to develop, before they leave the water and pupate in an earthen chamber on the shoreline. Larvae are often favored as fish bait. They do have powerful mandibles and can inflict a fierce bite. The adults are most often noticed when attracted to lights at night. They probably do not feed, and only live a week or so as they search for mates. This specimen was collected on oute 4 bridge over the Brazos River in Graford, Plano Pinto County, Texas. 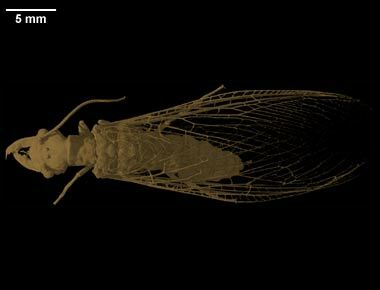 It was made available to the University of Texas High-Resolution X-ray CT Facility for scanning by Dr. John Abbott of the Department of Integrative Biology, The University of Texas at Austin and Dr. Timothy Rowe of the Department of Geological Sciences, The University of Texas at Austin. Funding for scanning and image processing was provided by a National Science Foundation Digital Libraries Initiative grant to Dr. Rowe. The specimen was scanned by Matthew Colbert on 18 August 2003 along the coronal axis for a total of 945 1024x1024 pixel slices. Each slice is 0.082 mm thick, with an interslice spacing of 0.082 mm and a field of reconstruction of 30 mm. Contreras-Ramos, A. 1998. Systematics of the dobsonfly genus Corydalus (Megaloptera: Corydalidae). Thomas Say Publications in Entomology. 360 pp. Stewart, K. W., Friday, G. P. and R. E. Rhame. 1973. Food habits of hellgrammite larvae, Corydalus cornutus (Megaloptera: Corydalidae), in the Brazos River, Texas. Annals of the Entomological Society of America 66: 959-963. Warren, L. O., Hite, O. and M. Hite. 1963. Seasonal flight pattern of the dobsonfly, Corydalus cornutus (Linn.) in northwest Arkansas. Journal of the Kansas Entomological Society 36: 256-257. To cite this page: Dr. John Abbott, 2003, "Corydalus cornutus" (On-line), Digital Morphology. Accessed April 25, 2019 at http://digimorph.org/specimens/Corydalus_cornutus/whole/.